Welcome to Fr Yousef Marie & Fr Jean Marie: from the Transalpine Redemptorists at Papa Stronsay. from Papa Stronsay. Fr Yousef is from Sydney, Australia (family originally from the Lebanon). He entered the Congregation of the Sons of the Most Holy Redeemer in 1999. He studied at Our Lady of Guadalupe Seminary in Lincoln, Nebraska and was ordained a priest June 2013 by Archbishop Guido Pozzo in Rome. Fr. Jean is originally from Mumbai, India and first entered the congregation of the Sons of the Most Holy Redeemer in 2001. He also studied at Our Lady of Guadalupe Seminary & was ordained April 2015 by Bishop Basil Meeking in Christchurch, New Zealand. Laetare/Mothering Sunday: Today we are at the mid point of Lent & Mother Church allows us to relax a little from the fast with flowers on the altar and the organ being played. The liturgical colour is softened from violet to rose and the Mass begins with the words “Laetare Jerusalem” (Rejoice Jerusalem). We contemplate the motherhood of the Church which is exemplified by our Blessed Lady herself. On this day we honour all Mothers & pray for them whether they are living or dead. We pay tribute to all of you who have worked hard to bring up children as this is the most important job in human society. God bless our Mothers! Lenten Extra Daily Mass: A slightly better turnout this past week. Please try to do better in the next weeks. Extra 10am Mass everyday this week because of our visitors. Congratulations: to all those children who made their First Confession yesterday. The second part of the FHC programme will be handed out in the meeting after 9.30am Mass. Join us for our St Patrick's Night Celebration - NEXT SATURDAY!!! : (12th March) 7 for 7.30pm. Enjoy a 3 course meal and live entertainment including Irish dancing, singing and poetry. Give your booking to Fr Chris or phone Mick on 07825 557 261. The night costs £20 per person. Sung by Cantores Missae under the direction of Mr Charles Finch. Tenebrae - Spy Wednesday (24th March) 7pm: As in previous years the Cantores Missae choir will be singing Victoria's poignant and powerful settings of the Responsories for the Office of Tenebrae. My Apologies: Fr CB forgot to book La Retraite for the Traditional Triduum (he has booked for 2017). Therefore Palm Sunday 11am, Maundy Thursday 6pm, Good Friday 5pm, Holy Saturday 3-8pm. 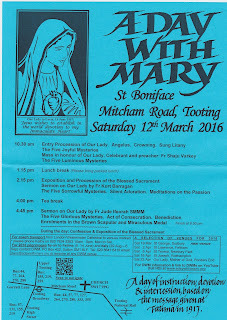 A Day with Mary: St Boniface Church, Mitcham Road, Tooting next Saturday. 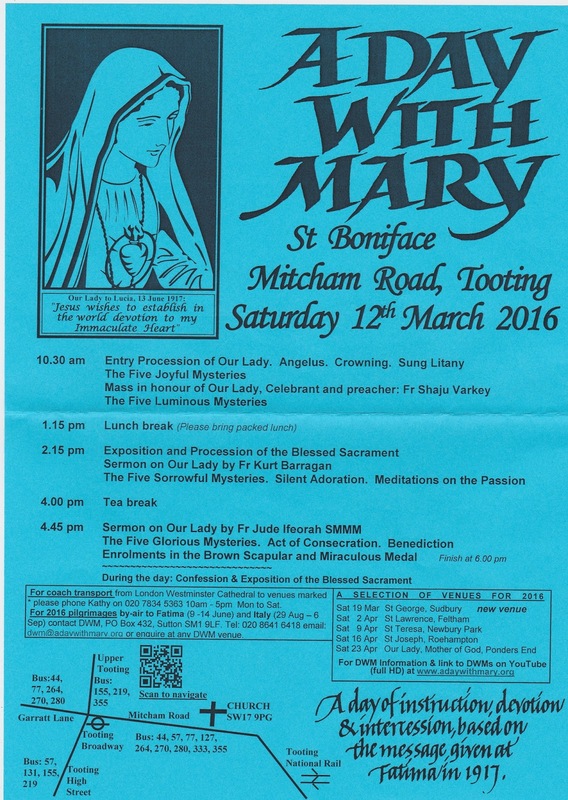 The day starts at 10.30am with an entry procession of Our Lady and finishes at 6pm. 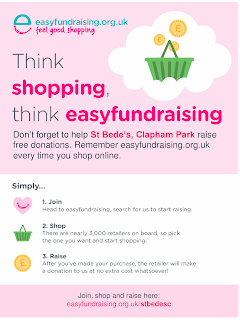 See poster for more information. Welcome back to Fr Lukasz: who has been in Poland. St Catherine's Trust Family Retreat: 1-3 April at Ratcliffe College nr Leicester with 2 priests from Papa Stronsay. Also at the same time/venue there will be the Chant Course with Colin Mawby & Chris Hodkinson. 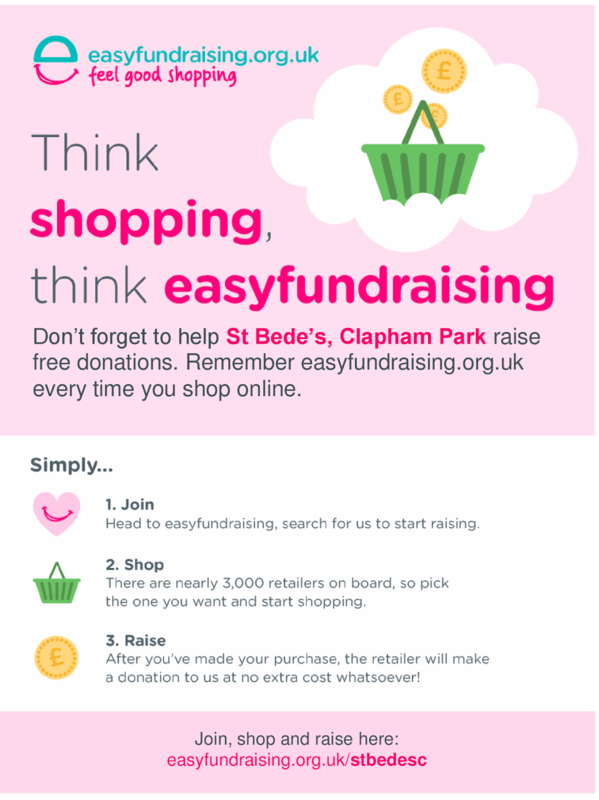 Contact John Tennant or see www.stcatherinestrust.org. Minibus places available. St Catherine's Trust Summer School: 24-31 July - with our very own Fr Andrew Southwell. For 11-18 year olds. Sung or High Mass, Rosary & Compline each day. Partasaph Friary, N. Wales. Minibus places available. Contact John Tennant or see www.stcatherinestrust.org. Confirmation Application Forms: are available from Fr Christopher today. Candidates must be in Year 8 at least and Bishop Patrick Lynch will be coming for this Mass on 3rd July. Welcome to God's Church: Reuben Li Wai Chan, son of Derek & Jennifer and Axel Joseph Roger Hayward, son of Daniel & Philippa baptised by Fr Christopher last weekend. Church Cleaners this week: Adebayo Family, Gloria Nwoso and Gina Uraih. World Youth Day - 25th July to 1st August: : Don’t forget to hand in your completed booking forms to Fr Pawel ASAP to secure your place on this trip. Please note: You must be over 18 to attend.